At my last radio station, somebody in management came up with the brilliant idea of installing “studio cams,” two different live cameras that broadcast on our website all of the action going on in the studio, just so our listeners could watch what happens on a live, big-time radio station. Let me boil down that action for you: have a friend or family member sit down. Then have them start to play a song on a CD player or iPod, etc. When that song ends, have them start another song. Then have them push an imaginary button and wait fifteen seconds (this would be a jingle). Then? You guessed it: start another song. I hate having my picture taken, so I was horrified by a two-camera live video feed. I worked nights, and I discovered that by turning all the studio lights off, and aiming our computer monitors slightly askew so they were off of my face, I was completely invisible. Once, I had a girl up there, and I had to look at both cameras and see if there was a place that was off-camera. There was: a little corner over next to the CD racks. It was hard to make-out with so little room, but we made it work. Sorry. My point is this: there are cameras everywhere. There are cameras on the streets, covering the sidewalks, watching over us at work. What’s more, we willingly subject ourselves to more cameras: Skype, webcams, selfies. We are a society used to being watched. Nobody is better at cameras than the space programs. They have outside cameras looking for system issues or possible collisions. There are inside cameras watching the astronauts work. If an astronaut goes outside the spacecraft, he or she has a camera seeing what he or she sees. So imagine a probe to Europa, one of Jupiter’s largest moons. Scientists think Europa is probably the best shot in our solar system to support life, as it has oceans of liquid water beneath it’s icy crust. The Maven, a giant manned space probe is built, and a crew of specialists is assembled for the extremely long trip to Jupiter. As you might expect, there are cameras everywhere, and they’re obviously not Cinerama film cameras. They’re tiny, like security cameras, and the space agency receives constant feeds on all of them, day and night. “Europa Report” has no action or plot, except what can be culled from these cameras. The only exception is when a project supervisor talks about how she was mystified at how what happens happens. I can’t explain why this made the movie so much more suspenseful for me. Maybe it’s because these people weren’t looking at the camera, or worried about the camera. They were doing a job. Sure, there was occasional mugging, but when it was time to work, they got busy. The scenes when various crew members are outside the space craft are especially haunting. There’s the panel they have to fix. There, beyond that, is light years of absolute nothingness. 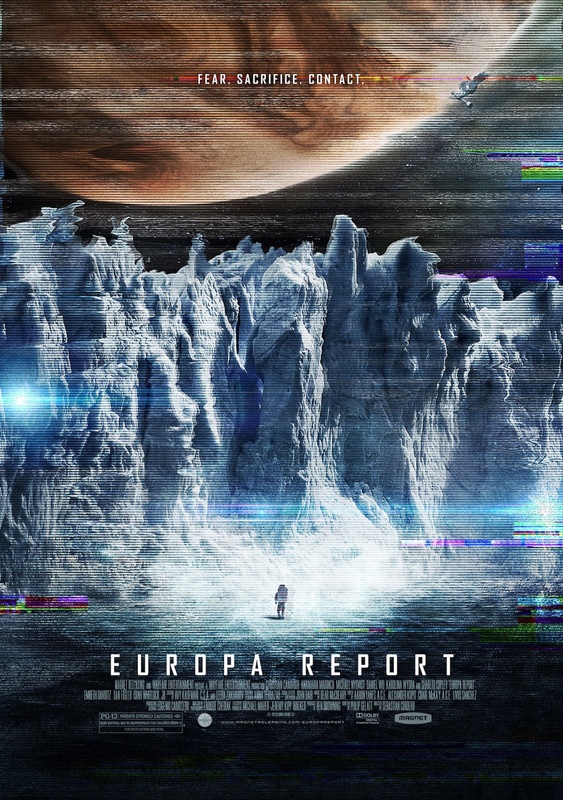 The actual plot involved in “Europa Report” is interesting, but it’s really negligible, just so much window dressing. The true mastery of the film is in the storytelling. The cast works well together. The Maven’s astronauts do NOT become a family, like the crew in “Serenity.” They are professionals, and they’re a bit tired of being cooped up with each other for the past bajillion miles. But still–being pros–they soldier on, even if it means sacrificing for the mission. The cameras in my radio station studio were ridiculous and irritating, as I never failed to point out to my boss. The cameras on the Maven were far more necessary, and they captured one hell of a story, a long, long way from home. This entry was posted in Films, Science Fiction/Fantasy. Bookmark the permalink. I really enjoyed Europa Report. I know the “found footage” film has been done a lot over the past decade, but this one had a great feel and a remarkable amount of tension for a film in which you sort of knew what was coming. I agree–it has been done to death, but it’s always amateur-quality footage (“Blair Witch Project,” e.g.). This footage was NASA crisp. I liked the periodic interference just for authenticity, and when they showed the gigantic wall full of monitors, each one following one camera, it pleased me. I’d never even heard of the movie till last night. It deserved wider exposure and more success.